After reading about the wheatgrass health benefits you will be tempted to try this green infusion! Contains 70% chlorophyll and is frequently called "liquid sunshine". Because of the level of chlorophyll it is highly energizing. Excellent source of Vitamin C, E, K. and B complex, including vitamin B12 which is a needed supplement for the vegan diet. Rich in calcium, iron and other minerals such as magnesium, potassium, protein, and zinc. Contains 17 amino acids.This long list of amino acids are important as they are the building blocks for protein. It also contains high levels of antioxidants, great for aging and ridding the body of air pollutants. It is alkaline and cleans the tissues and maintains the alkalinity of the blood. This helps with antiinflamatory conditons such as osteoarthritis. It actually helps to remove metals from the body which can be a great prevention of all kinds of health disorders. Because of its protein and iron content, it can be beneficial for anemia. It detoxifys the lymphatic system. Say goodbye to bad breath! It detoxifys and creates a healthier gastrointestinal tract. It may lower high blood pressure. All these nutrients can be helpful to the immune system. Learning how to grow wheatgrass and to reap the wheatgrass health benefits takes a little more effort than sprouts, but not MUCH. 1. 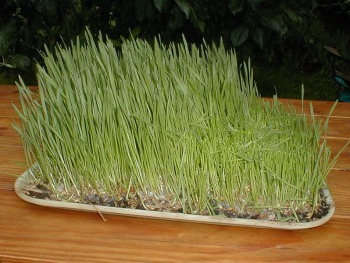 Make sure you are buying organic wheatgrass seeds (wheatberries). 2. You can grow in any pot or container, or in growing trays. Soil is recommended and I discourage growing hydroponically. 3. Soak wheatberries/wheatgrass seeds overnight. 4. Sprout seeds for 16-24 hours. 5. Plant in soil (make sure you have some peat moss added to soil) with a very short tail showing. 6. Water heavily and cover seeds with a cover to keep them from drying out. Water once a day in the morning, and mist once at night. 7. On the fourth day, uncover the seeds. Water heavily once a day, keeping seeds always in the shade. 8. Harvest when a second "shoot" splits off the grass at towards the bottom. Harvest by cutting low on the grass with scissors. Do not try to grow the seed a second time. The nutrition will be reduced by 50-75%. The wheatgrass will stay good in refrigerator for 7-14 days. The wheatgrass juice benefits are gained through juicing. Wheatgrass is simply indigestible for humans without it being juiced. You can get wheatgrass in supplement form such as dried powder or tablets. But it is simply not the SAME as fresh, raw wheatgrass juice. 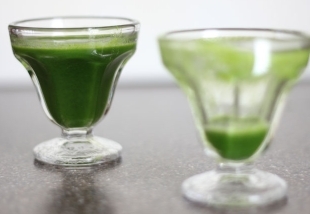 Wheatgrass is extremely fibrous so your typical juicer will not do the job. A wheatgrass juicer I have had in the past that did a super job was the Greenlife juicer. I understand they have been replaced by the Greenstar juicer. I have'nt used the Greenstar so cannot recommend it but you can still find the Greenstar on amazon, etc. For those out there that LOVE their Champion Juicer, you can purchase a wheatgrass juice attachment for about $75. Juice the ingredients. Drink in the super-fueled nutrition!